The vote on Any Questions on Friday night, broadcast from Newcastle, suggested that at least half the chattering classes are in favour of the protests in so many cities now against the disastrous financial status quo – including the one next to St Paul’s Cathedral in London. I certainly am, despite the pompous dismissal of them by both the Labour and Lib Dem representatives on the Any Questions panel (sorry, Jeremy, but you were). That doesn’t mean that I am somehow against the Church of England or the cathedral authorities, who – sticking to the terrible advice they have been given – have now given the go-ahead for eviction. So we felt that the best way we could demonstrate this was by visiting the camp and also going to choral eucharist in the cathedral. I don’t suppose anyone on either side understood the significance of my family, and my two small boys, being present in the cathedral, but there we are. It felt good at the time. Seen side by side, there is no doubt that St Paul’s wins the battle for beauty. The tent city outside, though it is scrupulously well-organised, clean and litter-free, is not beautiful. Nor did I get much encouragement from the deadly discussion on political correctness from the camp’s ‘assembly’ on the steps. But I did get to hear the excellent sermon, suggesting – in a distinctively Anglican way – that the real question is not what Jesus would have done, but what is he doing now? I don’t know the answer that that, of course, but suspect that he will be providing challenges from unexpected directions and people that will jolt us out of our complacency. That is why I believe the camp represents an important challenge. Not just the one at St Paul’s, but the one in Denver which was pepper-sprayed by police over the weekend, not to mention the protests in Syria which this movement is part of – confronting the tyranny of finance over life. The Arab Spring was always about economics at least as much as it was about democracy. Also on the steps of St Paul’s, I ran into one of the great names of the new economics, who I won’t quote by name because I haven’t asked him. But he set me thinking about what Gandhi would have done, and suggested it would have been to encourage camps everywhere outside churches. This is not to confront the churches. The churches are not the enemy. But it would be to challenge them to show the leadership they should be showing, understanding the urgency and overwhelming nature of the issue. It is a challenge to the churches, like Luther’s 95 Theses, to take their rightful place in the lead of the campaign against usury. Will they rise to the occasion? On present evidence, probably not. But this is just the beginning. There are always one or two people in public life who are a kind of touchstone. They only have to open their mouths and you find you disagree with them. Michael Howard, for example, and don't let's forget Polly Toynbee. "For countless others, though, not least in the churches, this was a hopeful sign that peaceful protests could indeed take place at a time when so many civil liberties have been eroded. Furthermore, it demonstrated that the Church is willing to play a sympathetic role in the lives of young people who are drawn to a movement calling for economic justice. "However, after their initial welcome to Occupy, the cathedral authorities then seemed to lose their nerve. In daily-changing news reports, the story see-sawed between a public debate about the merits or otherwise of the protest, the drama of internal disputes at St Paul’s over lost income from tourists, and the ill-defined health, safety and fire concerns that caused it to close its doors to worshippers. "One moment the church was reclaiming a valuable role in hosting public protest and scrutiny, the next it was looking in turns like the temple which Jesus cleansed, or the officious risk-averse ’elf ’n safety bureaucracy of urban legend. How could the dean and chapter at St Paul’s have let themselves get into such a position?" Good question. Sadly, Carey gets almost as muddled as the cathedral authorities as the article continues, talking about 'anarchist protesters threatening the right to worship'. For goodness sake, how does he work that one out? But I absolutely share Lord Carey's frustration with the church over this issue, and especially when it comes to the Bishop of London's intervention, claiming that the protests are a 'distraction' from the cathedral's own role in building a dialogue with the bankers and financial world. It is fine, and right, that the Church of England should have a dialogue with the financial world. But if this is the only tone of voice they are prepared to use against the tyranny of finance over life - the most important and urgent threat to civilisation - then they are not living up to their role of the body of Christ in the world. Worse, Dr Chartres implies somehow that the church is some kind if ineffable BBC, endlessly balanced and unbiassed on every issue, however desperate. As Churchill once said to the BBC: how can you be unbiassed between the fireman and the fire? St Paul's: where would Jesus pitch his tent? That was what William Blake said he heard when he listened to the sound of London. When you listen to the City of London now, with its subsidised banks and their lights blazing all night – the very centre of the global financial engine – you wonder whether there are any other noises at all. Certainly any spiritual noises. The mosque in Whitechapel, just outside the City, has nearly 25,000 worshippers on its books; many of them attend four times a day. Compare that to the echoing dusty, baroque churches of the City – a symbol of the spiritual bankruptcy that goes hand in hand with the power of finance. I am not at outsider in this. I am a baptised and practising member of the Church of England, so when the cathedral authorities at St Paul’s invited the protests to stay, it did seem for a moment as if the church had woken from its long moral doze. It seemed to be sole recognition that the church was aware of the critical importance of these issues, not just for spirituality, but for the future of civilisation – which would be in doubt in the event of a full financial crash. It was a recognition of a historic moment of decision – that the church understood that the financial world is vacuuming up the wealth, not just from London but from around the world. A belated acknowledgement that our financial institutions are actively impoverishing the globe. Now they have closed the cathedral. The Blitz closed it, and now apparently its that modern catch-all 'health and safety'. None of the other surrounding businesses have closed, but the cathedral has - which strikes me as just a little pathetic. The moment of decision has arrived and they close the cathedral. So while the cathedral authorities are right that St Paul’s is bigger than the protesters, that is only the case if the church rises to the occasion. It is not the case if they continue, ostrich-like, to ignore what has been happening in the tyranny of finance over life. I understand the inconvenience. I understand that, from an administrative point of view, it is awkward having tents within sight of their tea rooms - just as they did in medieval times at the gatherings at St Paul's Cross - but once to every man and nation/comes the moment to decide. This is theirs. Every so often, you run across an amazing and forgotten story that you know has to be preserved. I just did. So let me tell again the strange story of John Hatfield, the sentry at Windsor Castle. I'm not sure what year this was, except that it was during the reign of William and Mary and Hatfield was born in 1668. It was almost certainly sometime around 1690, when he was court-martialled for falling asleep on sentry duty on the terrace of the castle. At his trial, he vehemently denied it, and to prove he had been awake at midnight - when he was accused of being asleep - he said he had heard something very strange. Far across the countryside of the Thames Valley, he had heard the Great Tom - the bell in the tower opposite Westminster Hall - chiming thirteen times. Needless to say, this story did not go down well with the court. In fact, as far as they were concerned, it tended to prove his guilt. He was condemned to death. Before the hanging could be carried out, over the next few days, the news of his claims reached Westminster. Several people swore that, on the night in question, they had also heard the Great Tom stirke thirteen. It was a peculiarity of the mechanism caused by the lifting piece holding on too long. It seemed highly unlilely that Hatfield could have heard it as far away as Windsor, but the fact that he did proved his innocence. William III pardoned him. I don't know what happened to him later - it would be good to find out - but he died at his home in Glasshouse Yard, Aldersgate, on 18 June 1770, well into the reign of George III, at the age of 102. The bell tower was demolished in 1698 and the bell sold to St Paul's Cathedral. 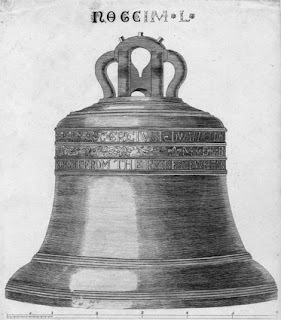 On the way there, it fell off its wagon at Temple Bar and cracked, was left in a shed in the cathedral for some years and was eventually recast in 1709 - in Whitechapel, the bell foundry which still exists - and hung in the bell tower of St Paul's where it sounds the hour. It is also used to toll for the deaths of members of the royal family, the Bishop of London, the cathedral's dean or the Lord Mayor - but only if he dies in office - but that, as Rudyard Kipling might say, is another story. Why don’t organisations and systems work? Well, they do, of course – and our own experience confirms why they work and why they don’t. We know perfectly well that any human systems that work have as my friend Pat Brown put it, “a personality behind them”. We have seen the efforts of individuals in schools and hospitals transforming the lives of those around them. We know from our personal experience that if you employ imaginative and effective people, especially on the frontline, and give them the freedom to innovate, they will succeed. If you don’t, they will fail. We know that, but for some reason when we rise up in the policy world something happens – maybe the cacophony of IT consultancies at our door – and we forget it. As a result, for the past generation, we have been engaged in a process that removes the human element from our public services. Of course human beings are fallible. But they are also the only real source of success and the only source of genuine change. Removing them is increasingly expensive and wasteful, because our institutions are that much less effective. That is the idea behind my new book The Human Element: Ten New Rules to kickstart our failing organisations. It suggests that services and organisations are failing because conventional ‘efficiency’ destroys that human contact and human relationships that make things work. It suggests it is one reason why – far from slaying Beveridge’s Five Giants – they come back to life again every generation and have to be slain all over again. I first realised this years ago at a conference on extended schools. The first speaker was an amazing headteacher, Debbie Morrison, then the head of Mitchell High School in Stoke on Trent, who is the first story in the book. She told the dramatic story about how the school had been turned around, and also her first day in post. There had been a commotion outside her office and her secretary warned her not to go outside. One angry parent had recently hit another member of staff around the head with a pair of muddy shorts. Three years on, another angry parent was head of their anti-social behaviour unit. Her friends had also taken responsible roles around the school. Debbie Morrison is one of those people who has a genius at making relationships with people and making things happen. After she sat down, the next speaker at the conference was the civil servant charged with rolling out extended schools across one of the regions. It was clear within a minute or so that he would fail – and for precisely the same reason that Debbie Morrison succeeded. He thought in terms of systems, KPIs, targets and guidelines. But he missed the one crucial ingredient that made the difference between success and failure. The human element, in other words. The Human Element is the result. I think it’s the most important book I’ve written, and covers everything I’ve been thinking since Authenticity was published in 2003, and draws some conclusions about what that means for the kind of organisations we need to run our lives. "David Boyle is a modern sage and this book is a business and organisation classic setting out the core of his insight and wisdom. You will feel better just reading it. You will do better by acting on it." Rolling Stone's outspoken financial commentator Matt Taibbi has proposed a rule that forbids banks that have accepted public money to bail them out from employing lobbyists. Why is NHS care so inhumane if you're old? I had to share James Naughtie’s astonishment at the responses of the Sandwell NHS Trust chair this morning. As if somehow more training and new systems were really an adequate response to the appalling news about care of older people in the NHS. It really is extraordinary that the care is now so bad in a fifth of all UK hospitals that they are breaking the law – not feeding patients, not helping them go to the loo, and a range of other abuses. We need some kind of working explanation for the complete disappearance of the public service ethos. Geriatric care has never been good, and there have been very dark corners even recently, but this ubiquitous disdain bordering on cruelty needs some explanation. Baroness Neuberger’s excellent book Not Dead Yet provides a fascinating insight into why some institutions feel human and some don’t, and – at least in the NHS – it doesn’t have anything to do with money. What she suggests is that volunteers are the antidote to this disdain. In wards where older patients might otherwise be mistreated or ignored, she says, “the mere presence of older volunteers are the eyes and ears that we need.” Human beings provide that kind of alchemy, however target-driven the institution is around them. It isn’t quite clear why this is. Is it because the presence of outsiders is a reminder to staff of what is important and how to behave? Is it because it stops them getting too inward-looking, or prevents that brutal contempt for customers that – as we have seen – can emerge in organisations, public and private? I don’t know. But there is a new frontier opening up in this debate about how human beings make things work, which suggests that it is not just about having other people there. The volunteers have an effect because they are working alongside staff. It is because the boundaries are blurring between the world inside the organisation and the world outside. I don’t know whether it would work the same way if the volunteers were just there observing, but I suspect that would just cause resentment. No, this is because they are equals. It isn’t just because outsiders are watching staff at work, it is because they are sharing the work that it is so humanising. It works because this is co-production. That is one way out, but don’t let’s pretend that it is really such a mystery why such modern institutions, targeted and standardised to within an inch of their lives, have become so inhumane. It is because the past ten years of centralised targets, standards and auditing has sucked the human element out of these and other institutions. They have been treated like assembly lines and now that is what they have become. If we are going to rescue our public services, we are going to have to inject the human element back in again. Find out how in my new book! Is there a new kind of efficiency? The disastrous NHS IT project , the great symbol of the pursuit of illusory efficiency (in this case at the cost of £12 billion) began with a meeting in 10 Downing Street in 2002 between Tony Blair, Bill Gates and associated hangers on. As early as 2004, seven years ago, the systems thinker John Seddon predicted that it would fail. He now predicts the same for the IT systems being designed at vast expense to deliver the Universal Credit. And for the same reason: these huge IT systems which are supposed to deliver services efficiently are too inflexible. They assume that public services are conveyor belts of standardised people. Consequently, they rack up the costs because so many cases do not fit the protocols and they bounce around between front and back office, hugely inflating the time and costs involved in dealing with them – or, more usually, failing to deal with them. This is a prime example of the way that services are becoming far more expensive than they need to be by removing the human ability to deal with complexity and make relationships, the subject of my new book The Human Element. But we are debating this and related issues at the Royal Society of Arts at 1pm on 3 November in an event called ‘Is there a better kind of efficiency’. I will be speaking, and nef’s Anna Coote will be in the chair. John Seddon will be there too, and Nesta’s Halima Khan to relate all this to co-production. Hope to see you there! My children's primary school is absolutely brilliant, so I won't name it here - or draw any conclusions about the school from this. But a phone call after lunch has reminded me quite how counter-productive Labour's safeguarding regime became. My youngest had been stung: was he allergic to stings? Probably not, we said, but could they put some ointment on it? No, apparently, they can't do things like that. I wonder if they would have been able to do anything if he HAD been allergic to stings. Would it have made him feel a bit better? Yes. Were we as parents OK about him being 'treated'? Definitely. Was there sting ointment on the premises? I assume so in a well stocked school medical room. But, no - they couldn't do it. I am, as it happens, right behind the coalition's determination to rid ourselves of the corrosive health and safety regulations that get in the way of humane care of children. This looks like a prime candidate for examination - but I don't agree with David Cameron's approach that this is purely an issue of public sector regulation. That may be the source of this kind of silliness, but it is just as likely to have come from insane and intrusive insurance conditions from the private sector. So I hope when the coalition finally acts on this, they also have insurance companies in their sights. The Kenyan environmentalism Wangari Maathai, who died last week, was not just one of the great pioneers of the new economics - which puts people and planet first - she also started out as a candidate for the Kenyan Liberal Party.